Known as the 'Roller Coaster Capital of the World', Cedar Point is one of Ohio's most popular locations. The park, which was opened way back in 1870, is the second oldest continually operating amusement park in all of the United States of America and is situated on the shores of Lake Erie in the city of Sandusky, OH. The park is open from May through to October and attracts more than three million visitors on an annual basis. As well as offering multiple rides and games, including the famed Blue Streak roller coaster, Cedar Point is also home to a huge water park named Cedar Point Shores, another water park called Castaway Bay, a large sports and fitness area, and a one-mile beach. In short, this incredible Lake Erie peninsula can be a true haven for everyone, from thrill-seekers to beach-goers. People of all ages have fallen in love with Cedar Point over the years and the park continues to grow and expand from one year to the next, with one of its latest attractions, a roller coaster called Steel Vengeance, opening up in May of 2018. If you'd like to visit Cedar Point, it makes a lot of sense to spend a couple of nights in the area. There are various places to stay around Cedar Point, including resorts and hotels, but if you'd like to enjoy an authentic experience and really appreciate the beauty of Lake Erie and the surrounding area, it can be a lot of fun to stay at a Cedar Point campground. It's important to remember that the cost of entry into Cedar Point and its water parks can quickly start to rise up, so if you'd like to save money, camping at Cedar Point is a fine idea. There are several top quality campgrounds to be found around Cedar Point and in the local Sandusky area. Read on to learn all about them. Definitely one of the most popular campgrounds around Cedar Point, the Lighthouse Point Campground also happens to be the best-rated camping spot in the area. Why? Well, the major factor of this campground is its location. It's situated just a short walk away from the Cedar Point parks, so it's highly convenient for park visitors. You can spend a full day in Cedar Point riding the rides and then just walk right back to your RV. On-site amenities include a camp store, laundry facilities, swimming pool, showers, wireless internet access for all, and more. There are around 120 sites at the Lighthouse Point Campground and guests at this campground can actually get deals and discounts on Cedar Point tickets, as well as early entry into the park! Part of the highly popular and successful KOA Holiday chain of campgrounds, the Sandusky Bayshore KOA campground is only a few minutes away from Cedar Point. After Lighthouse Point, this is the closest campground to the park, so it's a great option for people who don't want to have to worry about making the journey in and out each day. You'll find a lot of great amenities at this family-operated campground including free Wi-Fi, a kitchen, a snack bar, bike rentals, a pool, and more. Guests will also be able to choose from a large selection of tent and RV sites, as well as a deluxe cabins and glamping sites for people who want to enjoy the fun of the campground and the comfort of private accommodation all in one great package. Camp Sandusky is located just a 10-minute drive from the parks of Cedar Point. You won't be able to walk to and from the parks at this campground, but the short drive means that access is relatively quick and easy. The camp is fitted out with tent sites and RV sites, as well as luxury glamping cabins for those who prefer a little extra comfort. Amenities include a play area, store, sports courts, laundry facilities, and free wireless internet for all guests. 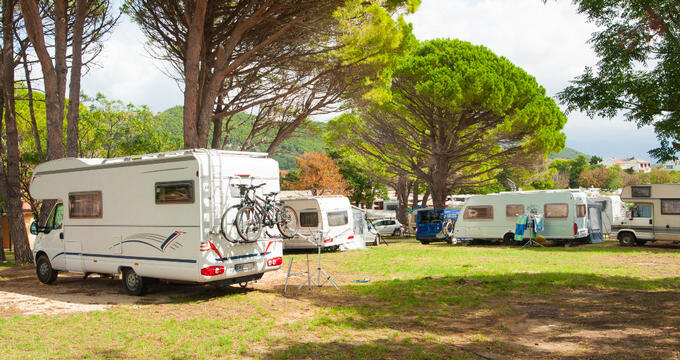 It's a highly rated campsite with a lot to offer and more than 200 sites, so you can always find a spot here. You can also get some great prices at this Cedar Point campground, with discounts offered to members of AAA, Good Sam, or the Cedar Point Platinum Pass. Crystal Rock Campground is situated a little ways east of Cedar Point, looking out onto the Sandusky Bay waters. This means you'll need to drive around 10-15 minutes to get to the park, but the isolated location of this campground gives it a nice, intimate, cozy sort of setting that many people will appreciate. After spending a full day in the parks with the noise and crowds, it can be very relaxing and refreshing to head back to the peaceful tranquility of Crystal Rock Campground. This Cedar Point campground supports tents, campers, RVs, and motorhomes. Not only that, but there are several private cabins available for rental too. On-site amenities include free Wi-Fi, restrooms, a store, showers, laundry facilities, sporting areas, a kids' play area, and a BBQ pavilion. Guests can also stop off at the on-site Crystal Rock Mining Company Gem Mine, learning more about the mining trade as they pan for gems in the running waters.